Sandia scientists Jason Harper, Melissa Finley and Thayne Edwards with a BaDx anthrax detector. 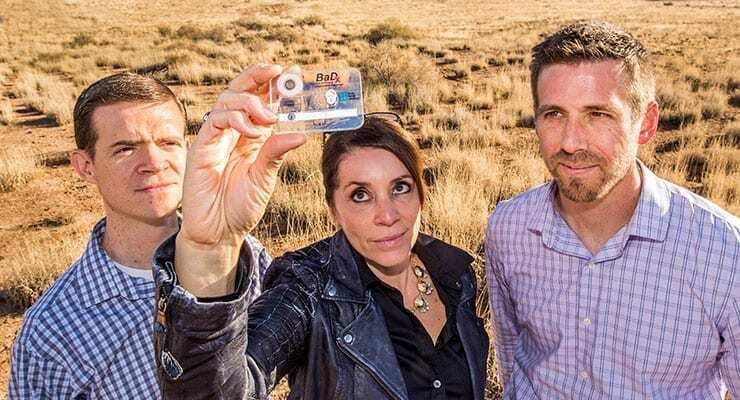 Sandia National Laboratories won the Federal Laboratory Consortium’s (FLC) 2015 Award for Excellence in Technology Transfer for a credit-card-size device that can detect bacteria that cause anthrax. BaDx (Bacillus anthracis Diagnostics) works in places with no power, refrigerated storage or laboratory equipment. It requires minimal or no training and makes anthrax testing safer, easier, faster and cheaper. The annual Award for Excellence recognizes employees of FLC member laboratories and non-laboratory staff who have accomplished outstanding work in transferring federally developed technology. A panel of experts from industry, state and local government, academia and the federal laboratory system judge the nominations. A Laboratory Directed Research and Development (LDRD) project in Sandia’s International Biological Threat Reduction Program led to BaDx. While a large team helped develop the detector, the FLC award recognizes scientists Thayne Edwards, Melissa Finley and Jason Harper. The technology was licensed to Aquila, a New Mexico woman-owned small business that specializes in the design and manufacture of technologies and services for nuclear security and international safeguards. Bacillus anthracis, the anthrax bacteria, is found in soils worldwide and can cause serious, often fatal, illness in humans and animals. It can survive in harsh conditions for decades. Humans can be exposed through skin contact, inhalation of spores or eating contaminated meat. The most common diagnostic test for anthrax costs around $30, which is out of the reach of many farmers, perhaps discouraging them from testing animals they suspect are infected, Finley said. The new device, which is like a pocket-sized laboratory, could cost around $5-$7 and does not require specialized tools. BaDx needs no battery or electric power or special laboratory equipment. It’s hardy against wide temperature variation and can detect very small numbers of B. anthracis spores. A field technician puts a sample swab into the amplification chamber, which contains selective growth media. The device then uses a lateral flow assay, similar to a common pregnancy test, to detect B. anthracis. Magnetically operated valves allow the sample to advance from stage to stage to complete the testing process. A colored line appears on the device several hours later, if the test is positive for the bacteria. The technician can then initiate a chemical process that sterilizes the device, avoiding the risk of positive samples accumulating and falling into the wrong hands. “The device amplifies the B. anthracis so it can detect as few as 100 spores instead of the typical 1-10 million required for detection,” Harper said. Harper and Edwards developed the microfluidics platform with the patent-pending magnetic valves that move the sample through the testing process. Bioscientist Bryan Carson, with technologists Jackie Murton and Bryce Ricken, developed the selective media, worked on building and testing the device and helped develop the decontamination strategy. Nanotechnology researchers George Bachand and Amanda Carroll-Portillo are working on improved strips for the lateral flow assay. Bill Arndt, a researcher in Sandia’s International Biological Threat Reduction Program who regularly works in the developing world, provided guidance on device design. Their work builds on Sandia’s long-standing expertise in bioforensics, most visible in the work the Labs did in response to the anthrax spores mailed to media offices and two U.S. senators in the fall of 2001, killing five. The FLC is a nationwide network of about 300 members that provides a forum to develop strategies and opportunities for linking laboratory mission technologies and expertise with the marketplace. The FLC Awards Program annually recognizes federal laboratories and their industry partners for outstanding technology transfer efforts and has become one of the most prestigious honors in technology transfer. Since it was established in 1984, the FLC has presented awards to more than 200 federal laboratories.